In a land obsessed with the afterlife, it is strange that Indian movies have not yet explored the genre of zombies. Or have they? Think of the Ramsay movies and their heavily made-up "ghosts" - skin peeling off, rotting flesh, slow movement, weird growls, bloody; maybe the Ramsays were ahead of their times. Nobody acknowledges their creations as the original Indian zombie films. So we'll go with Raj and DK's conviction that Go Goa Gone is the first movie of its kind in our film culture. Apparently, Kunal Khemu showed the script to his prospective brother-in-law, Saif Ali Khan, and the latter was so blown away by the story that he went ahead and not only produced it, but also starred in it, thus adding star value. Even Soha Ali Khan has a cameo in the film. Luv (Vir Das) and Hardik (Kunal Khemu) share a flat with their childhood friend Bunny (Anand Tiwari). Luv and Hardik dope and drink the whole day, and somehow manage to get through office hours. Bunny, on the other hand, is the ideal employee. Luv finds out that his girlfriend has been stringing him along, and Hardik is about to be kicked out of his job. With nothing to lose, they pile on to Bunny, who has to get to Goa and make a presentation on behalf of his office. The useless duo convinces Bunny to accompany them to a rave party on an island (because he has money and they do not have any). The party is hosted by the Russian mafia. The trio discover that no boat wants to take them there, so they decide to rent a boat, leaving Bunny's car as a deposit. The party is wild, and all have fun. The mafia also launches a new Siberian pill that Hardik cannot afford. Despite the disappointment, he has a blast, and even gets lucky with a girl. The next morning, he wakes up alone on the beach, and sees a horrible sight. As the three friends reunite, their adventure begins. From rescuing a Facebook friend, to being rescued by mafia boss and zombie assassin Boris (Saif Ali Khan) and his associate Nikolai, the group keeps learning from their experiences as they try to make it off the island. The male bonding aspect of the story concentrates on Luv and Hardik, making this a bromance. They always take advantage of Bunny, till they realise his worth. It is a story of friendships overcoming all obstacles, at one level. There is a deeper message here, which one of the actors voices out towards the end - drugs are harmful. In fact, Saif Ali Khan begins the movie with a short film in which he talks about how he learned the hard way how harmful smoking can be. Ironically, almost everybody in the movie has a cigarette, a joint, or a cigar in his or her mouth in every scene. The dialogues are peppered liberally with curse words. And there is the Russian accent. Despite all this, the makers educate the audience on what a zombie is, and how it can be destroyed, very effectively and without being condescending. Given that the average Indian film-goer has never seen a Hollywood zombie flick, Go Goa Gone is a veritable encyclopedia of all things zombie. The genre may be horror, but the wit makes the film a treat. The humour in dialogues and situations will make the grouchiest man chuckle. The second half falters a little, in its pace, but picks it up very soon. There is not a single dull moment. The directors and producers have tried to pass off Mauritius as Goa, and they have succeeded. In fact, since the characters go around in circles, you become pretty involved in the location - the routes to take or avoid, the danger behind trees, and so on. The cinematography is non-intrusive, and effective. The production and costume designs are subtly appropriate. The music is a delight, but the main hero is the editing - crisp and fun. This movie belongs to Kunal Khemu a little more than it does to the others. He is more than terrific - he is unrestrained and unapologetic. Vir Das is a treat, as is Anand Tiwari. 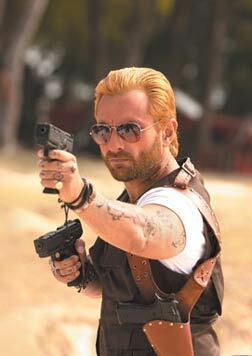 Saif Ali Khan does a decent job with his Russian accent (exclusive to his dialogues in Hindi). His blond hair takes a little getting used to, though. Puja Gupta begins well, but becomes arm candy after a point. The guys' car (which also gets a special mention in the credits) has more character. The movie ends on a high note, paving the way for an inevitable sequel. Watch Go Goa Gone for more than just the zombies - the irreverent humour, the good acting and the cinematography. You'll come out laughing. And watch the end credits song - it is a riot. Be the first to comment on Go Goa Gone! Just use the simple form below. fullhyd.com has 700,000+ monthly visits. Tell Hyderabad what you feel about Go Goa Gone!